It isn't about "games", for me, personally, and it never really was. It was about creating something- anything- far bigger than yourself. 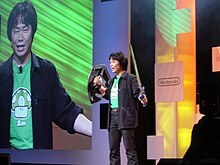 Shigeru Miyamoto (born November 16, 1952) is Nintendo's most respected video game developer. Any new media or industry that grows rapidly is going to be criticized. That's just because the older, more established media have been around, and a lot of adults can be very conservative. They may not have an open mind to new things that weren't around when they were growing up, and are replacing the things they grew up with... over the years I've seen this standard image of a child playing a video game in which the child is alone in a darkened room, with his face very close to the TV, with the light of the TV reflecting off his face, holding the controller and just staring at the TV. I'd really like to be able to change that image of video games into something that's a little more positive. Games are a trigger for adults to again become primitive, primal, as a way of thinking and remembering. An adult is a child who has more ethics and morals, that's all. When I am a child, creating, I am not creating a game. I am in the game. The game is not for children, it is for me. It is for an adult who still has a character of a child. So you know cats are interesting. They are kind of like girls. If they come and talk to you it's great. But if you try to talk to them it doesn't always go so well. When we’re doing an action game, we make the second level first. We begin making level 1 once everything else is completed. Controller is so intuitive, even your mom can play.